Mechanics Special and Fully Operational, however; My Technician Suggest Tune Up Prior to Extended Driving, New battery purchased in November,2016 and Power Window Motor needs replacing. I am the 2nd Owner and have the majority of the maintenance records and service documents extending back to previous owner. This is a non-smoker vehicle with Spacious Interior. Comfortable travel experience for extended road trips. Interior is in good condition with 4 High Back Bucket Seats, 3 row seating. Back row seats 3 and folds down into sleeping area. Body is in Fair condition with minor cosmetic blemishes as follows: The right rear quarter panel has small crack, dent in back door and abrasion to paint, small hole in BACK spare tire compartment. Drivers Vent window missing closure and missing driver’s door switch. I have owned this for 5 years. It is a great van. I painted it with my vision 3 years ago. Its ready to go anywhere.Tones new.Please ask all questions. 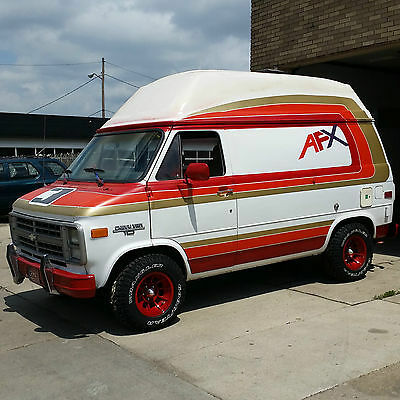 Normal 0 false false false EN-US JA X-NONE 1978 Chevy G10 Shorty Panel Van “Carpeted Surfer” 1978 Conversion Original Cordova Brown Paint 128k Runner & Driver! Please bid only if you can afford to pay within 3 days of auction's end. Please contact me directly at 360-936-9257 with any questions you may have; thank you. 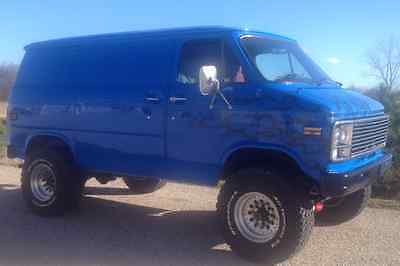 ~Tim This is a genuine original 1978 Chevy G10 half-ton short wheel base custom conversion panel van. 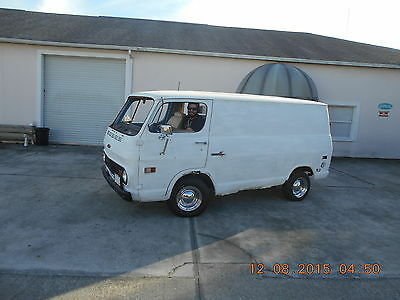 This is a true SWB full panel van with windowless rear doors and the license plate in the factory rear bumper; rare van. 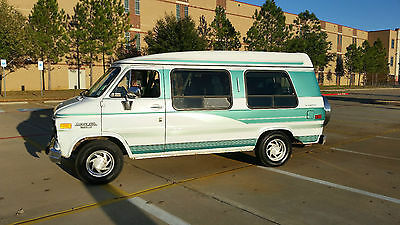 This was “the” van to buy and customize back in the 70’s. Very hard to find...you won’t find another like it anytime soon. Here’s your chance to build your own custom Chevy Street Van and not break the bank. Call Tim at 360-936-9257 with any questions. 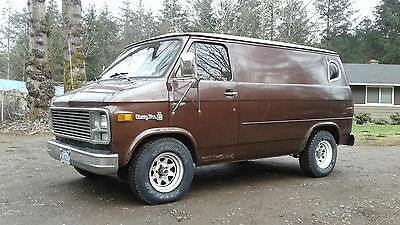 Factory 1978 Chevrolet G10 half-ton short wheel base windowless panel van. Original Cordova Brown Metallic paint in and out, original 350 4v V8 engine with fresh tune in good running condition. Factory options include Power Steering, Power Brakes, Tinted Glass, AM/FM 8-track stereo, Tilt Wheel, Gauge Package, Heavy-Duty Radiator, Chrome Grill, Chrome F & R Bumpers, and more. This is a super rare factory-authorized “Carpeted Surfer” custom conversion including custom interior, teardrop side windows, roof vent, sunroof, wagon wheels, chrome tube grill, and trailer tow package performed by Trail Wagons in Spokane, WA in April of 1978 when the van was new. The door pillar has their manufacturer’s tag dated 4/12/1978 as well as the Chevy tag. Very nice newer custom “hand-scraped hardwood” flooring treatment, very nice sidewall and ceiling treatment. Clean, looks almost new, and includes a clean vinyl-backed hinged stuffed foam sleeping/rear seat mat as well. Tired original conversion swivel Captain’s chairs are cool, and allow the seats to spin around to face rear to entertain with your friends. Dash and doghouse are good, can be restored with vinyl dye. Gauge cluster looks good and all gauges seem to work. Crack in front windshield, good side glass. Only known mechanical issue is heater core bypassed, probably leaks. There may be other small issues, but this is the only issue I am aware of. The van is a runner and driver with current registration, fresh tune-up, and oil change. Newer Edelbrock 4v carburetor, otherwise seems stock. Turbo 400 auto trans shifts fine. Original Cordova Brown metallic paint (Root Beer Brown), no touch-ups, nothing hidden. Actually very straight with only minor dings. Minor rust on p/s rear wheel edge (leading, lower), side door lower edge, and a couple minor pinholes in the d/s rocker under the door. Sunroof will need to be properly resealed. Floors are great, rockers solid, nothing hidden. Super easy and minor fixes before your new custom paint job. Add flares, visor, front spoiler, rear spoiler, custom paint, wheels/tires, and go to town! I’ve taken close-up pictures of every “problem” area I can find so you can see exactly what you’re getting. All issues are minor in my opinion. The main vehicle pictures are taken from approximately 10’ away, so you get a good idea of what the van looks like in general appearance. Clear title in hand, matches VIN exactly for inspection and export. Current tags and registration. While every effort has been made to describe the vehicle as accurately as possible, it is in fact a 39-year-old classic, and therefore being sold as-is, without warranty or guarantee expressed, written, or implied. Please be ready to make payment in full within 3 days of auction’s end via deposit into my Bank of America account, or bank wire transfer Shipping is the full responsibility of the buyer; I own a classic car restoration shop and can recommend a reliable and affordable broker who I have used many times... ultimately the choice must be yours alone. Feel free to call me directly at 360-936-9257 with any questions you may have. 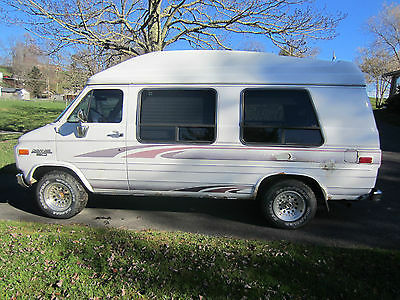 Selling my 1995 Chevrolet G20 Gladiator Conversion Van! Drives and looks great inside and out! It has a V8 5.7L engine and automatic transmission with a clean title and registration tags good through July 2017! The PERFECT Road Trip Van! PRICED TO SELL! !Chevy SportsVan comes equipped with:-4 Luxury Captains Chairs-Power windows, mirrors, and locks-Tilt steering wheel-Air conditioning pumps hot and cold-Walnut Wood accents on dash and doors-AM/FM stereo radio, front and read speakers-Interior overhead lighting-Deep factory tint on windows with cloth shades / curtains-Plenty of space, comfortably seating 4, with enough room in the back for a double bed!-5 Doors including two rear access doors-Running boards-Towing package-Green exterior paint with stripe detail-Spare tire-V8-Automatic transmission-Tons of room for 4 people and all your gear - surf boards, camping equipment, bikes, the lot!Back seats have been removed by previous owner to allow space for a double bed (not included). Its a spacious and road ready camping van! I have loved it and looked after it and you will too.I have just given her a service. New Power-steering pump & new radiator. It is running and driving well. NO SMOG - Van may need new catalictic converter (approx $200). Buyer to buy As Is, and obtain Smog Test.Some marks along the right side foot skirting. Otherwise GREEN Paint looks great! Well looked after. PRICE REDUCED TO SELL!! Moving overseas soon - make me an offer. Relisted due no response from previous high bidder. Cash on pick-up onlyCall, text, or email with any questions you may have, or if you need more photos, thank you! This is a good working condition van with original miles. Second owner. We need to sell van because we don't use it. It has refrigerator and sink. 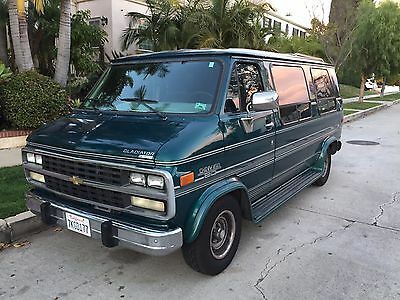 Selling my 1995 Chevrolet G20 Gladiator Conversion Van! Drives and looks great inside and out! It has a V8 5.7L engine and automatic transmission with a clean title and registration tags good through 2017! The PERFECT Road Trip Van!This Conversion Van comes equipped with:-4 Luxury Captains Chairs-Power windows, mirrors, and locks-Tilt steering wheel-Air conditioning pumps hot and cold-Walnut Wood accents on dash and doors-AM/FM stereo radio, front and read speakers-Interior overhead lighting-Deep factory tint on windows with cloth shades / curtains-Plenty of space, comfortably seating 4, with enough room in the back for a double bed!-5 Doors including two rear access doors-Running boards-Towing package-Green exterior paint with stripe detail-Spare tire-V8-Automatic transmission-Tons of room for 4 people and all your gear - surf boards, camping equipment, bikes, the lot!Back seats have been removed by previous owner to allow space for a double bed (not included). Its a spacious and road ready camping van! I have loved it and looked after it and you will too.I have just given her a full Service. New Power-steering pump & new radiator. It is running and driving great. NO SMOG - Van may need new catalictic converter (approx $200). Buyer to buy As Is, and obtain Smog Test.Some marks along the right side foot skirting. Otherwise GREEN Paint looks great! Well looked after.CAMPING EXTRAS:I also have camping EXTRAS should you wish.-Rear Bike rack PLUS 3x Beach Cruiser bikes. Awesome Rides-Cooler-Battery Pack for extra camping power, light and jumping-Water storage, Ropes, cleaning gear, cooker, air pump, double air mattress for easy set up, camping lamp.Selling to downsize to a more city friendly car. Cash on pick-upCall, text, or email with any questions you may have, or if you need more photos, thank you! 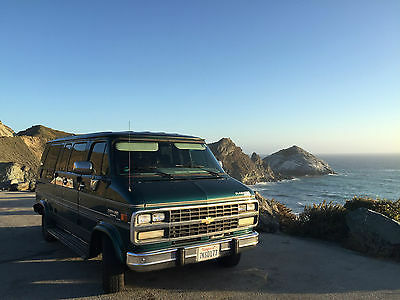 Selling my 1995 Chevrolet G20 Gladiator Conversion Van! Drives excellent, looks great inside and out! It has a V8 5.7L engine and automatic transmission with a clean title, smog and registration tags good through 2017! The PERFECT Road Trip Van, Ready to hit the road!This clean conversion van comes equipped with:-4 Luxury Captains Chairs-Power windows, mirrors, and locks-Tilt steering wheel-Air conditioning pumps hot and cold-Walnut Wood accents on dash and doors-AM/FM stereo radio, front and read speakers-Interior overhead lighting-Deep factory tint on windows with cloth shades / curtains-Plenty of space, comfortably seating 4, with enough room in the back for a double bed!-5 Doors including two rear access doors-Running boards-Towing package-Green exterior paint with stripe detail-Spare tire-V8-Automatic transmission-Tons of room for 4 people and all your gear - surf boards, camping equipment, bikes, the lot!Back seats have been removed by previous owner to allow space for a double bed (not included). Its a spacious and road ready camping van! I have loved it and looked after it and you will too.I have just given her a full Service. New Power-steering pump & new radiator. It is running great and drives superbly for a big van!Some marks along the right side foot skirting. Otherwise GREEN Paint looks great! Well looked after.CAMPING EXTRAS:I also have camping EXTRAS should you wish.-Rear Bike rack PLUS 3x Beach Cruiser bikes. Awesome Rides-Cooler-Battery Pack for extra camping power, light and jumping-Water storage, Ropes, cleaning gear, cooker, air pump, double air mattress for easy set up, camping lamp.Selling to downsize to a more city friendly car. Cash on pick-upCall, text, or email with any questions you may have, or if you need more photos, thank you! 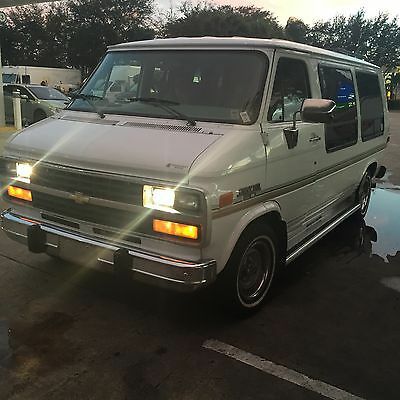 1992 chevy gladiator conversion van runs great g20 3/4 v8 350 5.7 automatic Clean clear mississippi title. van is located in dallas texas 75206. Van was just cleaned inside and out and has 178,000 some miles on it. Since 2008 the van was only driven 20,000 miles. Grandpa hit a pole in the front of the van so fender bumper and grill are damaged. I checked at junk yards and you can get all parts for about a 100 bucks if you ever wanted it fixed. Van drives and runs just fine and damage does not affect the van at all besides the look. all lights and blinkers work. the cruise control does not work neither does all the power locks. heat works great and i have not tried the ac so lets just say that needs a charge to work. Van has a exhaust leak not to loud but you can notice it. Also i took the rear blower motor out and bought a new one that will go with van. We just payed to have a new fuel pump, oil change, a new used transmission installed that was bought from a salvage yard and both front window motors replaced. We have the receipt and will include in the pictures and payed over 1,100 dollars for all of that. 20k ago van had new tires shocks brakes rear axle seal, alignment, rotors turned, right outer tie rod end, pitman arm all replaced professionally and have that receipt also and will include in the pictures. I installed a new heater core and belt tensioner myself and i have receipts for that also. We recently took van to the cotton bowl and back and van did great there and back. I've put 400 miles on van in last month and haven't had any problems and cruises real nice on the hwy. Has no problems cruising 70-80 mph on the hwy. Temperture stays under the half way point at all times and sits there and runs really nice. Would like 500 deposit into paypal when auction is finished and rest in cash in person. Van has two or 3 sets of keys also. Has 2 mini tv's a vcr. Also the bed in the back needs one cable replaced on the front right side of the front motor to be able to lay down. Van comes with full size bottle jack and spare tire. PLEASE LOOK AT ALL PICTURES AND IF YOU HAVE ANY QUESTIONS PLEASE ASK THANKS SO MUCH. 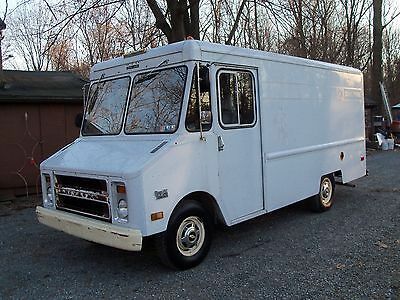 Up for sale is a 1979 20 Series 3/4 TON Chevrolet Aluminum body Step Van. It is in very good condition all the way around. The automatic transmission shifts smooth and has zero issues. The motor is a GM Factory Crate motor that has about 30,000 miles on it since it was installed. It runs like a top and also has zero issues. The tires,brakes and exhaust are all in tip top shape as well. It was just had an annual Pennsylvania inspection done in June of 2015. It took nothing to pass. All the lights, horn, windshield wipers, radio, heater etc..work. There is some rust on the grill. This step van needs nothing. It also has three ladder hooks on the passenger side. Great turn key truck for your small business or what ever you may use it for. If you have any questions please feel free to ask. 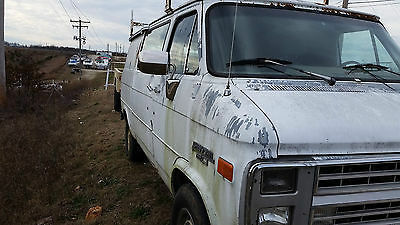 Chevrolet : G20 Van Work Van Chevy work van with ladder rack. Van is very rough, but is running and drives. The reverse gear needs work. Has a running 5.0 liter V8. Clear title. The odometer reads 171378.9. I have no reason to believe it has been reset, but cannot make any guarantees since I have n o way of knowing. I have the van for sale locally so reserve the right to cancel this listing if I get a local offer. Chevrolet : G20 Van CARGO VINTAGE ! 1969' CHEVY G-10 CARGO VAN,GASSER.,HOT ROD,SCOOBY DOO MYSTERY MAC. 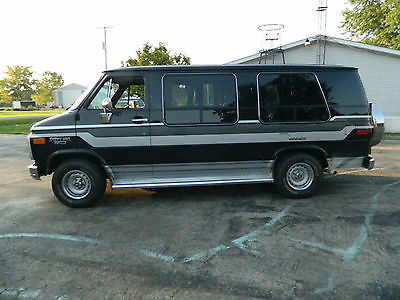 You are bidding on a 1994 Chevy Van VIN# 1GBEG25K4RF155009 that is equipped with a Braun Vangater Wheelchair Lift. This van starts right up. I put a new battery in it within the past two months. The van has a big 5.7L V8 engine. The van needs new tires before driving (the tires on the right side will only hold air for a few days before going flat). The interior is not in the best shape & may require new carpet & some repairs. The exterior also has some dents & rust. This is not a newvan and if you are looking for a new van, this one is not for you. If you are looking at an inexpensive van that could use some minor repairs then this van may be right for you. 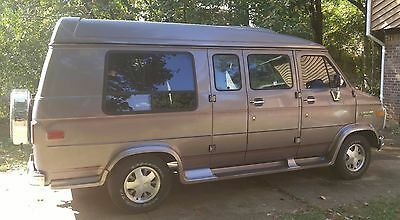 I just want to make a potential buyer understand that this van is 21 years old and is going for a fraction of the price that a newer wheelchair van would sell for due to its age & condition. The wheelchair lift opens the doors, folds down, extends out and will not extend down to the ground. The last time my father used it he had no problems with it so I'm not sure if it is just out of some oil/lubrication or if it needs an adjustment. The lift looks to be in great condition. My father passed away so we no longer have any use for this van. The buyer is responsible for arranging & paying for delivery of this van. It is located in Beckley, WV 25801.